The present manual is one of the tools used to enhance the impact of NFL in preparing young people for their social and professional development, as well as a tool for increasing the importance and the quality of youth work. - To emphasize the importance of group processes, emotional condition and the specific environment for the effectiveness of the training. This manual contains a large amount of information based on the long-term experience of the authors in the field of non-formal learning (NFL) and the interactive teaching of children, youth and adults. During its composition a lot of information related to the topic was used from various sources - studies, reports and scientific publications. By combining practical experience of the team of authors with theoretical concepts this manual was created to bring together a big number of topics, many of which are often not touched upon in the field of NFL and in the youth sector. 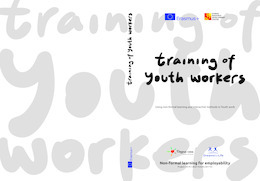 We tried not to repeat topics which are popular and available in the field of non-formal learning in youth work when selecting the topics for this guide. We have included concepts that are not widely known in the field of youth work (and neither in formal education) - Multiple intelligences, Socio-cognitive learning, Learning styles, Stages of development, Self-efficacy and others.